FIXYOURTHINKING.COM / Need a brain? Borrow mine! : Apple Customers Rejoice As Apple Techs Lose Revenue! Apple Customers Rejoice As Apple Techs Lose Revenue! If you've been tempted by Panasonic's new HDC-DX1 AVCHD camcorder seen heading our way, then check this DVD drive from Japan's Logitec (no, not Logitech). 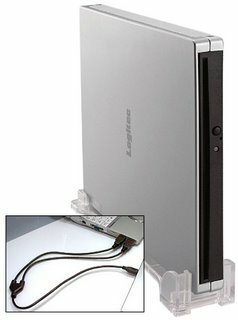 The LDR-PMC8U2 is said to be "an industry first" to slot load those 8-cm mini-DVDs used by Panny's 3CCD recorder. 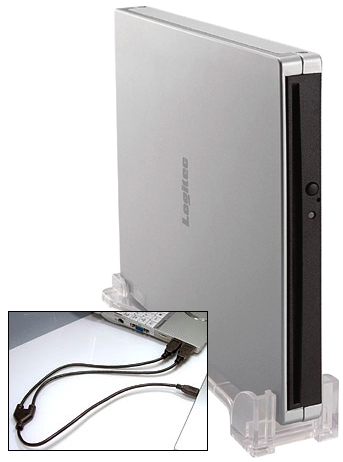 It also supports standard format CDs and DVDs with an on-the-go bonus Y-USB cable for drawing power off 2x USB ports when 5V just ain't enough to support the unit's max read/write data rates: 8x DVD±R/+RW, 5x DVD-RAM, 6x DVD-RW, 4x DVD+R DL/-R DL, 24x CD-R/-RW 24, and 8x DVD-ROM and 24x CD-ROM. It also touts Labelflash support for burning custom motifs or images onto compatible media. All in a slim, portable drive measuring just 17.5-mm (0.69-inches) thick. Hitting Japan at the end of December for ¥22,050 or about $188 should they ever come this way. As an Apple Tech ... I welcome this "innovation" ... I have fished 5 8cm mini CDs (from Sony CD digital cameras) over the last 5 years out of slot drives.